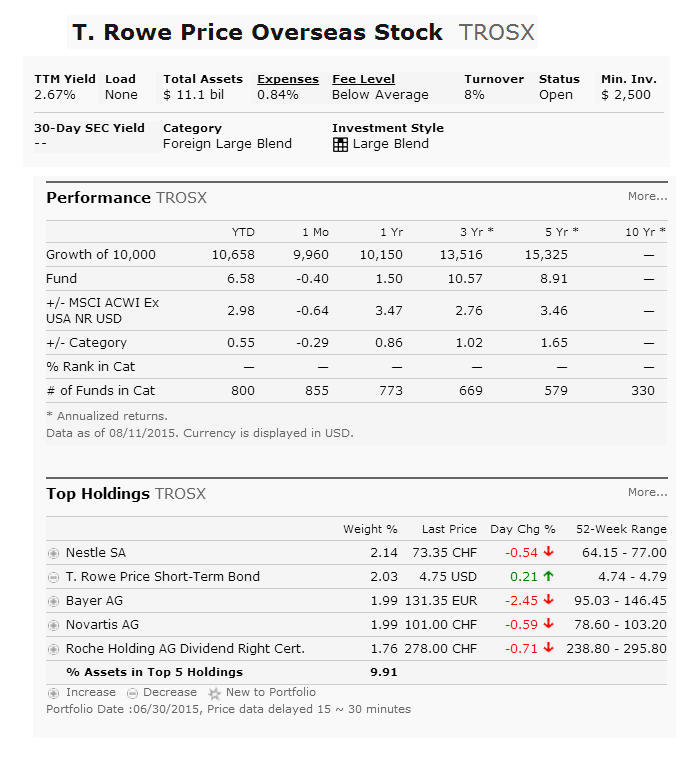 T Rowe Price Overseas Stock Fund (TROSX) is a popular international stock mutual fund. It invests mainly in stocks of non-U.S companies. The fund objective is to provide capital growth. This TRP fund utilizes its assets to purchase stocks of companies located in developed countries such as Germany, Spain, UK, Japan, etc. It may also invest in emerging markets around the world. Typically, the companies are considered as large cap companies. The fund manager is Raymond A. Mills. This foreign large blend fund has $10.9 billion of assets. It has a decent dividend yield of 2.67%. The expense fee is only 0.84%. The current share price is $10.11. This T Rowe Price Overseas Stock fund has no sales load. Morningstar has ranked this equity fund with 4 star rating. In 2015, it has year-to-date return of 7.32%. It has a 3 year average return of 11.96%. This fund has returned 1.02% over the past 1 year, and 8.71% over the past 5 year. You can buy this fund from 86 brokerages. Some of the fund’s brokers are Schwab, Merrill Lynch, and JPMorgan. You can invest with $2,500 initial funding for your investment account and $1,000 for your retirement account such as Roth IRA, and traditional IRA. Top 4 stocks in its holdings are Nestle SA, Bayer AG, Novartis AG, and Roche Holding AG Dividend Right Cert. Top 3 sectors are financial services, consumer cyclical, and healthcare. 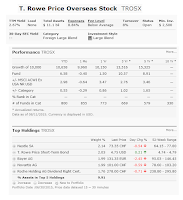 T Rowe Price Overseas Stock fund has solid returns for the past 3 years. It has a dividend yield for income. There is no sales load. This fund invests substantially all of its assets in the stocks of large companies outside of the U.S., and diversifies broadly among developed and, to a lesser extent, emerging countries. The fund seeks to select stocks with a favorable mix of company fundamentals and valuation. Of course, investing overseas holds special risks. Some of the risks are political uncertainty, unfavorable currency exchange rates, and to a lesser degree, market illiquidity. However, the fund’s flexibility to invest throughout the international marketplace can help reduce volatility relative to funds that concentrate on a particular region or country.